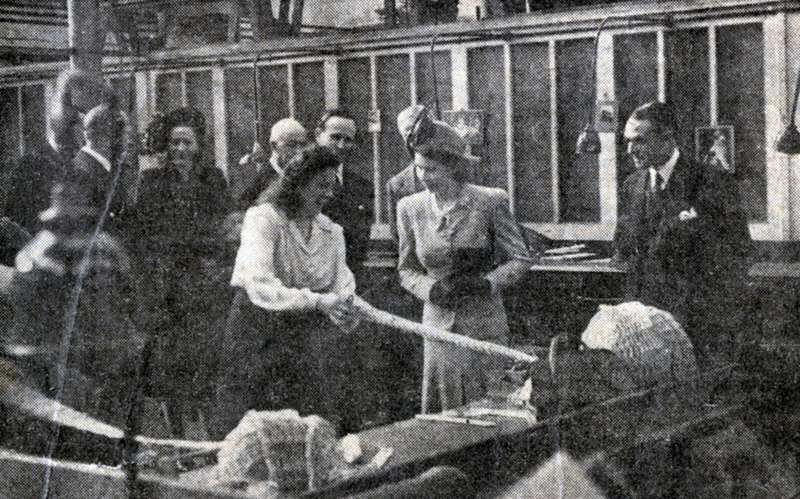 Brilliant sunshine and cheering crowds greeted Her Royal Highness Princess Elizabeth on her visit to Wolverton Works to view the coach that had been built for her and the Duke of Edinburgh. Whilst officially termed a ‘private visit’ over 5000 people lined the route from Wolverton Works to Wolverton Station. The royal coach consisted of bedrooms, bathrooms, lounge, dining room, kitchen and offices. As she left the coach the Princess commented that everything they needed was there and it was ‘lovely’. With a soft green colour predominating, the coach was complete down to the last detail, the table was set for lunch, there was soap in the bathrooms and vases of daffodils adorned the tables. Frequently during the tour the Princess stopped to chat with workers and asked many questions. She showed a lively interest in all the processes of building a railway coach. The tour came to an end after nearly two hours of continuous walking. As the Princess got out onto the street a load roar went up from the crowd who had been waiting outside all afternoon. This entry was posted in Archive, Living Archive, People, Places, Wolverton, Wolverton Works and tagged royal vist, wolverton railway works. Bookmark the permalink.